Who says every record player needs to have a retro look and feel? The Steepletone SMC386 certainly goes against the trend and has created a sleek record player that really embraces a modern look. It’s the perfect way to enjoy the music of the past in your home, and it does so much more than you think. Regardless of the platform, your favourite tracks are stored on, this record player has a solution for you. Before you disbelieve me, all you need to do is scroll down to find out. So, if your music is spread out across tapes, CDs, and vinyl records, you have the solution right in front of you. The Steepletone SMC386 takes everything that’s good about past and modern tech and combines it to create the ultimate music player. It’s not perfect, but it comes pretty close, and that is why I have taken the time to write a detailed and exciting review on what makes this such a brilliant piece of kit. Now is the time to take a moment to kick back, read my Steepletone record player review, and see if this is going to be the perfect model for you. On first look, it might seem a little bulky and intimidating, but this setup is actually pretty compact, and it is ready for you to play all of the music you love. Whether you still have your old cassette tapes, or you went completely digital, this record player can accommodate you perfectly. If you are searching for something that looks modern, feels up to date, and still plays the old records you adore, the Steepletone SMC386 is the perfect match for you. Made to impress, it does everything you could want and more, and has more additional features than you think. Perfect for private listening or sharing with the world, it’s a good one for blasting out tunes. Of course, it might not be right for you, and if this is the case, it is worth checking out our comparison models at the bottom of this review – each of which has their own detailed reviews for you to read. It is a little bulky, and there are a lot of extras, not to mention that it isn’t exactly portable. The good thing is that it is not too expensive which makes it the best turntable under £200. So, if these sound like deal breakers, head on down to the comparison area for more selections. The overall design of this record player is quite boxy and chunky, and it comes in either black or silver. Despite this chunky look, it does have a very modern feel, and you are sure to love the way it fits in with your home once you have it all set up. You could say it has quite a professional appearance, and looks like something you might have in a club. The record player is located on the top, and there is a dust cover to keep it safe and free from grime. The controls are located on the front of the machine, and there are a lot of them. It might seem a little overwhelming at first, but they are all clearly labelled, and you can see which parts of the record player they control. Due to their position, they are easy to access, and there is even a remote control included so that you can make all of the adjustments you want without having to move. The volume controls are also excellent, although when using the record player, it can be a little quiet if you compare it to the overall volume of the CDs and Bluetooth streaming (two things we look at in the next section). However, the turntable comes complete with pitch control and strobe illuminator for full customisation. It also has a clear LCD display to let you know which tracks you are listening to, the time, or which station is currently playing. The arm of the Steepletone SMC386 is excellent in terms of quality, with fantastic balance and complete freedom for adjustments when you want them. It is also gentle on the record, and you can benefit from the automatic stop function so that you don’t need to get up and change the track yourself. This may need some manual adjustment depending on the record size, however. There is so much that the Steepletone SMC386, and so this section is quite an exciting one. The first thing to start with is the USB and SD card recording. 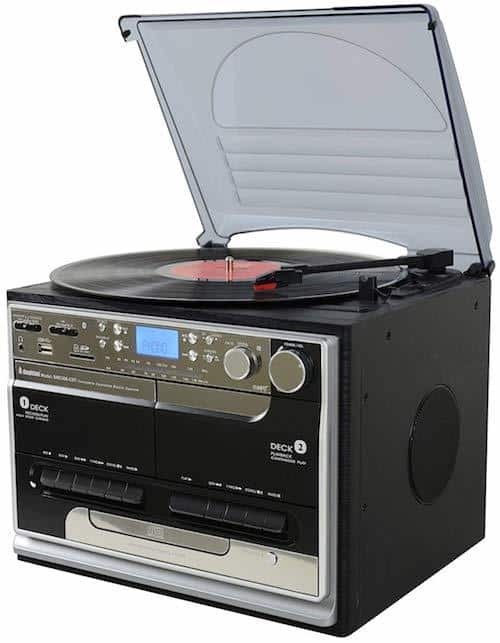 This great USB turntable allows you to take your records and convert them into digital files using the software provided. You can use it on PC or MAC, and while you may have to manually edit some of the tacks yourself, it’s really simple to use. There is a twin cassette player installed, and this allows for both playing and recording – giving it even more function. You can listen to your old tapes and record new ones with ease, and the quality is simply fantastic. The CD player is located below the tape decks, and both have easy controls so that you can find what you want quickly. Additionally, this model also has FM and AM radio stations preinstalled so that when you don’t feel like listening to albums anymore, you can tune into your local station. The reception is very good, and the tuner lets you flick through the stations quickly until you find the right one. Bluetooth is a really popular feature, and the Steepletone SMC386 has incorporated it wonderfully. You can hook up your smartphone with ease – allowing you to stream music smoothly and seamlessly through the integrated speakers. This is ideal for when you are throwing parties or gatherings and want to mix the music up a little bit. The built-in speakers are excellent quality and have a lot to offer, but if you want bass or treble, you will need to use the included subwoofer jack to hook up some external connections. However, this is pretty quick and cheap, so you shouldn’t have much trouble reaching the perfect sound levels. There is also a headphone port that will let you plug in for a while if you fancy kicking back to some tunes in private. 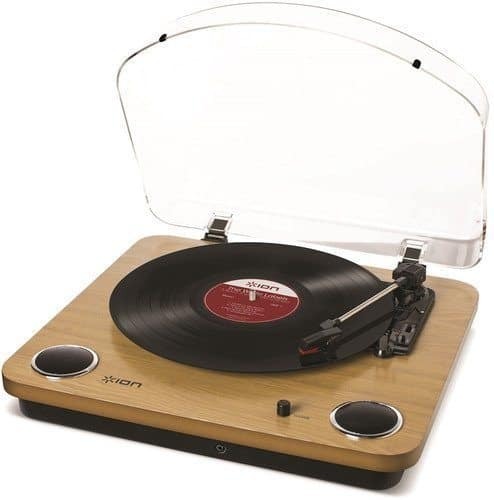 The Steepletone SMC386 is a compact model, especially when compared to the other record players and decks that Steepletone manufacture. Despite this, it still remains quite heavy and bulky and so is not the easiest to carry around and transport, meaning that it would not suit being used as a portable model. However, it will sit nicely in your home due to its compact nature, and standing at only 350mm tall you are sure to find an excellent location for it. Here are some other, similar, models of record player for you to consider, just in case you want to look at other options before you commit to the Steepletone SMC386. 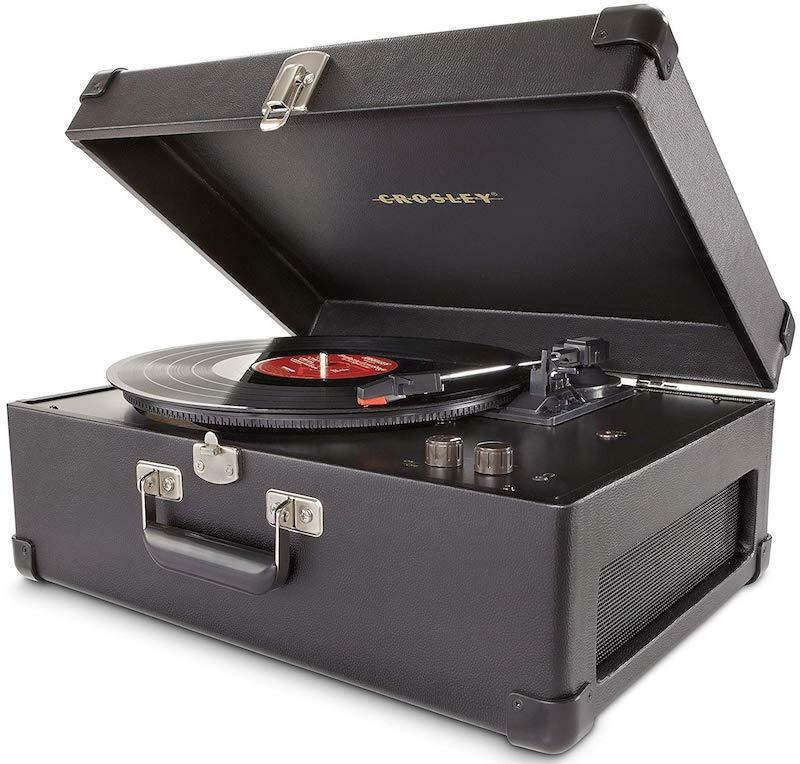 With Crosley, you are guaranteed a record player that looks good and sounds amazing, and the briefcase design really is the icing on the case. 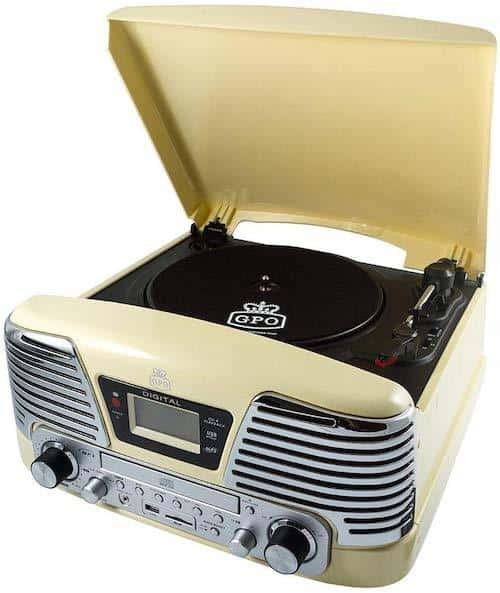 Completely portable, it plays every record with ease, and you can even use the USB port to convert your records into digital files. With the option to connect to external speakers and simple controls, it has everything you need on a budget. This great Ion record player comes with so much that you wouldn’t expect within this price range. With a retro feel and gorgeous wood finish, it adds a drop of the past to your home. The USB port means you can convert your vinyl records into digital files, and you can even connect your smartphone up if you are feeling like something a little different. You can even use headphones. This record player has a look that is incredibly unique, and while it looks like a stereo, it also is one. With a CD player and FM radio included, as well as easy file conversion and streaming music directly from your phone, there isn’t much more that this model could offer. It’s one of the best out there, and the price is pretty amazing when you look at how much is included. 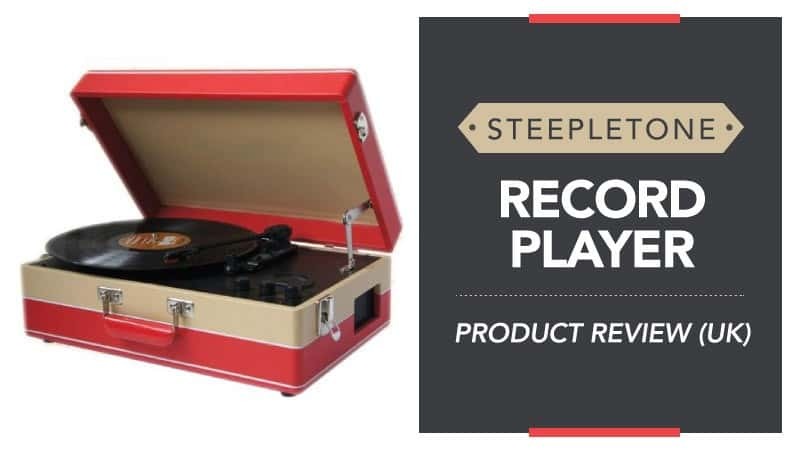 We hope that you have found this Steepletone record player review helpful, and that all of the information I have given you is able to aid you in deciding whether this model is going to be the right one for you, your home, and your needs. The Steepletone SMC386 really is a fantastic piece of kit, and it does so much. You can listen to cassette tapes, CDs, music straight from your phone via Bluetooth, and, of course, vinyl records. On top of that, it has a headphone jack, digital conversion software, and a really stylish look that just screams modern. In many ways, it is the full package. Despite being a compact model, it is still a little bulky, and this also means that it cannot be transported between locations very easily. The speakers can also be a little quiet when using the record player, but this is only minimal and when compared to the CDs. Otherwise, it makes for an excellent record player that really does incorporate everything you could want into one. What did you think of our Steepletone SMC386 review? Do you agree with our thoughts on the radio we reviewed, or are there others that you think are better suited to the task? We love hearing from you, so make sure you leave us a message in the comments below.